When I was a kid my favourite season was summer because I did not need to go to school, I loved sunny days, warm evenings without any assignments. And with ages my love of summer did not change. I still remember the games at the camp, our wilderness adventures, bugs and campfire. Even now when I explore and gather information about camps for kids, I check camp activities and locations and imagine how I spent my summer vacation as a student. I was impressed with Pioneer Camps, welcoming youth, students and graduates every year, programs and activities they offer. Pioneer Camp is a Christian summer camp that is committed to helping children and youth grow physically, intellectually, socially and spiritually. Pioneer Camp is one of a collection of Pioneer Camps that are uniquely serving their regions and communities in Alberta, Manitoba, British Columbia and Ontario and today they host more than 5,000 boys, girls and families each summer and have an Outdoor Education program through the off-season. I wrote recently about #Circlesquare summer camps, and the contest they are hosting. 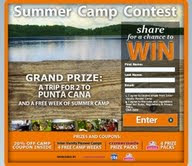 Even more exciting to learn that #Pioneercamp also has a great contest to win: prizes from Mabel's Labels, crossroads prize packs, free weeks at #Pioneercamp (this one is my favourite) and an awesome Grand Prize - a trip for two to Punta Cana .